Penetration testing is very similar to compression testing with one key difference: the probe is typically much smaller than the sample being tested, such that the surface is pierced, or punctured. For this reason, the method is referred to as puncture or penetration testing. Full penetration means that the probe passes fully through the sample.The probe accessory choice for puncture and penetration tests is varied: cylindrical, with sharp edges, radiused edges, or blunt tips, spherical, conical or needle shaped and also a selection of material finishes. 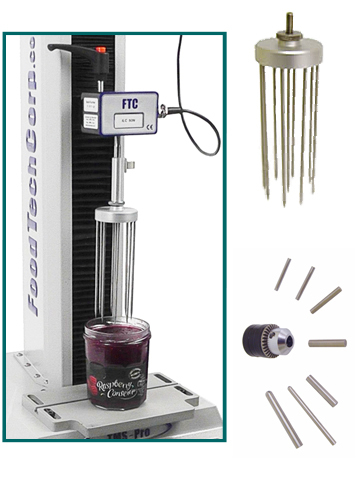 FTC has a range of probes which cover many texture testing requirements. FTC also offers a selection of specialized fixtures to perform multiple-penetration and industry-standard penetrometry procedures. The probe is the upper, moving, fixture and consideration must be given to the lower, sample presentation or securing accessory if the penetration resistance is to be accurately measured. Using an appropriate fixture with an aperture ensures a “punch and die” test and avoids compression behaviour as the sample is not constrained in the area of deformation.